Potato is my family’s favorite vegetable and we prefer to eat it during any meal. Potato is a commonly used vegetable in every household like onion. 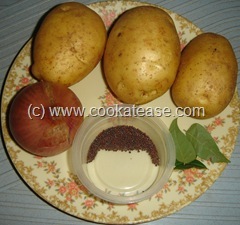 Potato is available throughout the year and has long shelf life without refrigeration. Potato is an energy food and contains potassium, iron, magnesium, folate and some other minerals. Potato is easy to handle and can be cooked with confidence. 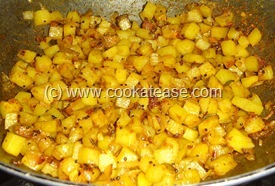 My first cooking adventure started with potato in Mumbai. I prepared plain potato fry without peeling the skin. Here I have prepared again plain potato fry for Shama’s First Cooked Food Event. Later I started using potato to prepare Boiled Potato Fry, Potato Round Fry, use as stuffing in Masala Dosa, Capsicum, Bitter Gourd, Lauki Kofta, use in Vegetable Pulao, in Brinji Rice, in dal, in Baingan Bartha, in Poori Kizhangu and as Raitha. 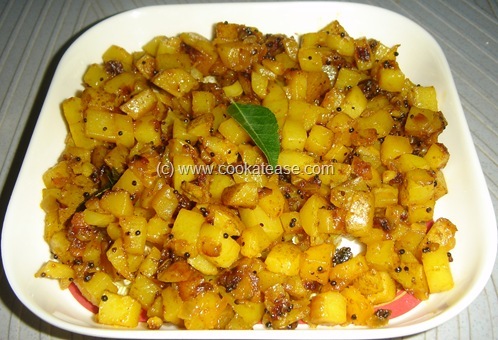 Wash twice or thrice potatoes, cut into small pieces without removing the skin; chop onion and curry leaves. 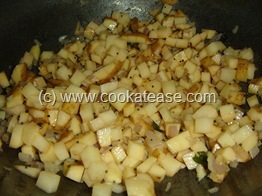 Heat a pan, do the seasoning, add chopped onion; fry for few seconds, then add potatoes and fry for 2 minutes. 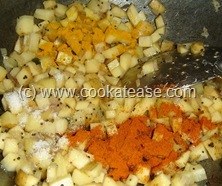 Add turmeric, chilli powder and salt; mix well, cover with a lid and cook for 5 minutes in low flame; in-between stir. Now plain potato fry is ready. Suits well with rice and chappati. If necessary soak potatoes for 10 minutes in water and then wash, as potato has to be cut without peeling the skin. 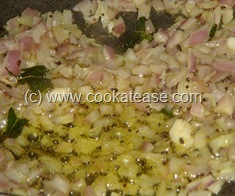 As potato gets cooked with closed lid for most of the time in low flame, no need to add more oil. 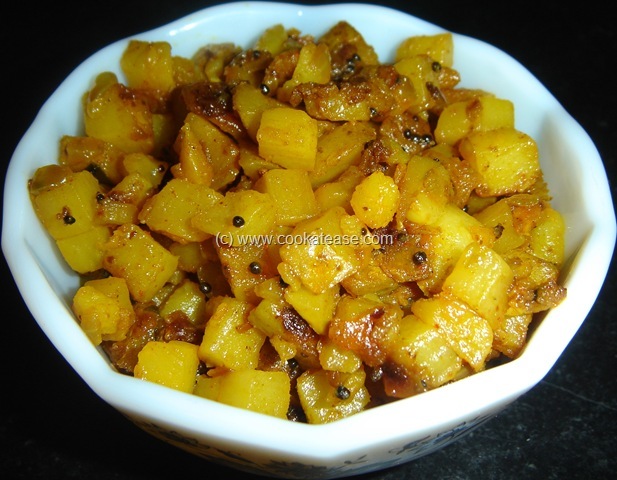 Its my fav veggie too…simple one but really seems a tasty one too..
its our favourite combo with rice too..